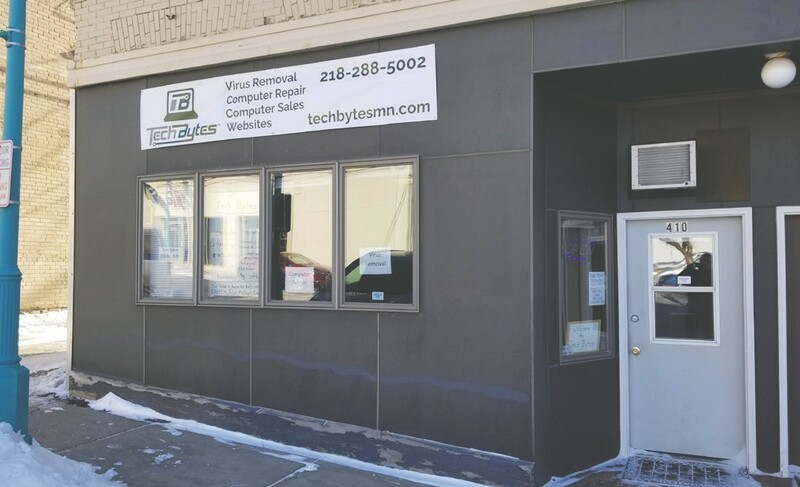 EVELETH – I established Tech Bytes, a computer repair business, in January of 2018. Services we offer include: virus removal; computer repair and tuneup; computer and computer part sales; web design and maintenance, search engine optimization (SEO); analytics, and more. Tech Bytes is located at 410 Jones St., in Eveleth. Individuals and small-medium sized businesses are our ideal customers. I earned a B.S. degree in computer information systems/computer science with a concentration in business. I’ve been repairing computers and doing websites for about 16 years along with computer repair and web design. I got into this business because I’ve known since I was in high school that I wanted to be in the technology field—it has always been a passion of mine. I really got into technology back in my senior year of high school in 1999 when I was one of three students who installed and set up all the computers from K-12 for all of the teachers. Once I started doing that, I knew this was my field. After working for myself for many years, I wanted to keep going—working for myself. Yes, it takes many hours and is more than a full-time job, but every minute is worth it. Making sure the customer is happy is our top priority. From previous experience, I have learned that loyalty and following through with what you say is huge in business. As some may know, starting out is a very expensive and time-consuming time in a business, but the rewards are so much more. As the owner of Tech Bytes, I run the day-to-day operations and work on computer repair, programming, and sales. My mother Debbie Miller is our office manager. She handles the bookkeeping, customer relations, answering the phones and taking care of scheduling. John Long is our lead repair technician who handles computer repairs both on- and off-site. Michael Langlais is our web programmer. He builds and maintains websites, works on SEO, analytics and more. Tech Bytes works with our customers with respect and we give them advice on what we feel is the best solution for them. We can help with computer or web services. We also thoroughly clean computers and do what we can to avoid re-installing the operating system back to factory settings. I really like seeing the happy customers when they get their computer back or their website is launched. One difficult part of our business is when we have to tell a customer that we are not able to fix their issue (even though it is rare) or that we are unable to recover their data after a hardware failure, virus or any other possible reason. I don’t like unhappy customers and want to help as many people as we can. The most rewarding part of the business is finishing a job and seeing the happy customers. It is worth every minute seeing their smile. I’m running this business with what I have believed in for many years, and that is to treat customers the way I would like to be treated and to be fair to everyone. For those needing advice and help with computer issues, stop by the Tech Bytes office in Eveleth, or call us at 218-288-5002. We will do our best to answer questions and see how we can help. 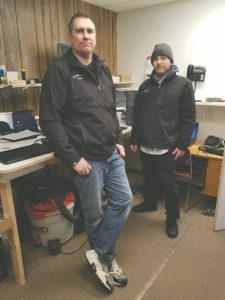 Owner Dustin Miller (left) and lead repair technician John Long provide computer services both on- and off-site.